A Seoul court on Thursday handed down prison terms of 18 months to 2 1/2 years for two of the closest aides to former President Park Geun-hye and suspended the sentence for another on charges they took illicit funds from the spy agency and delivered them to Park. 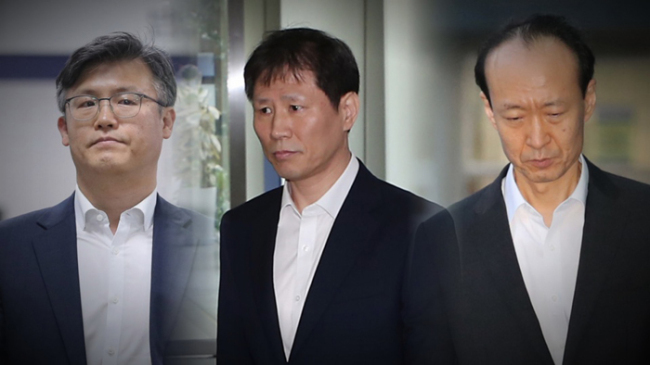 The Seoul Central District Court sentenced Lee Jae-man, former presidential secretary for general affairs, to 18 months in prison and Ahn Bong-geun, Park's former secretary for public relations, to 2 1/2 years. Jeong Ho-seong, another ex-presidential secretary, was sentenced to 10 months, suspended for two years. The three were indicted for playing roles in Park's taking of between 50 million won ($46,000) and 200 million won every month from May 2013 to July 2016 -- a total of 3.5 billion won -- from the National Intelligence Service. Prosecutors demanded they be imprisoned for four to five years. The court ordered Ahn to pay a 27 million-won fine for spending part of the money for personal use. But the court ruled that the National Intelligence Service fund they took cannot be seen as bribes, but a misappropriation of state funds by the NIS provided to the ex-president.